Character Discussion | "Just walk with me.."
Posts and discussion focused on a particular character, rather than an episode or topic. Hello my fellow smk fans! JWWM typically focuses on following the journey, sticking with the story as an episode unfolds and staying in the moment with the characters… However, if we don’t step back and look at the big picture we can miss out on some great discussions…insights and fun!! The big picture does come up during episode discussions.. but I thought it could be handy to provide one place to place these thoughts if anyone is so inclined to share- at any time! How do you see Lee and Amanda’s love story so far? What phases do you see this story moving through? What individual phases do they undergo that impact the love story? What were the big milestone episodes for you and why? When we say ‘love’ does this mean different things at different points in the story for you? Don’t feel restricted to addressing these questions.. roam and explore the overall love story however you like. Just please remember to not refer to anything that hasn’t been covered in the walk yet… thanks guys! 🙂 I fully expect we will see different things.. honestly, there is no one right way to see things.. I love to hear others thoughts and ideas – they help me to explore and expand my own too. A great discussion in post 10/19 Season Four Episode Two: Stemwinder Part II prompted this focus on the big picture.. In this post, Amanda says: We have each other; that’s something. Lee responds: Yeah. It’s more than most people in this business will ever have. I didn’t think we’d have to go through anything like this to find out that we’ve got it. Lee and Amanda have come so far!!! We may disagree on a few bits.. but that’s cool no one’s thoughts are more valuable or accurate than any others in my book!! [Except maybe Francine’s and Dr Smyth’s!!! I draw the line there!!! ] If you would like to put together a blog post on your thoughts- rather than comment on this blog post to share them? I’d be very happy to publish it for you too!! I look forward to hearing people’s take on this wonderful love story! I was worried that the inaugural Laser Shark Award would be its last. Gordon Redding set the bar pretty high and I wasn’t sure any of our Season Three baddies were up to the challenge. So, Gordon Redding spends 6 years in prison plotting to avenge his brother’s death. 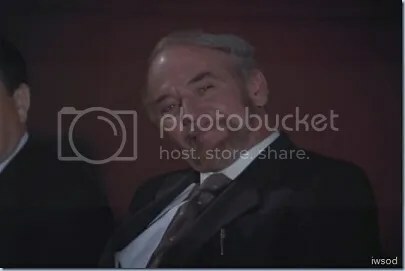 And then he hires Karen to shoot Treloggen, Creadle and Lee Stetson, from a distance. The End. JUST KIDDING! No, that plan is way too easy and would actually succeed. A much better way is to pay for Karen’s plastic surgery so she looks like Amanda, have her study Amanda’s habits for months, even down to duplicating those fugly earrings, have her take Amanda’s place and seduce and kill everyone at point blank range. But luckily for all of us, there were enough convoluted episodes in Season Three to give out the award. Krutiov (current Silver Teaspoon recipient) was in contention, because of all the degrees of freedom involved. Krutiov manipulated Valentine (by wearing blue suits? 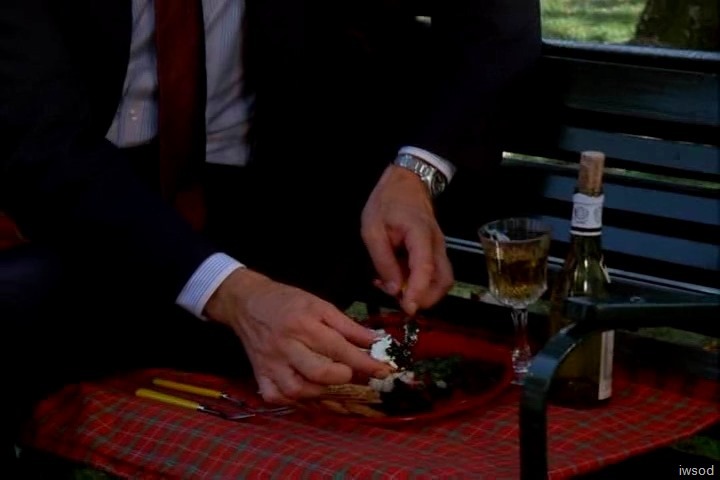 I think Krutiov’s master manipulation of Valentine just involved waving a lot of money in front of his face) to manipulate Tony to get to Maria Van Klaussen. It was pretty far-fetched and you just know Krutiov really enjoyed the challenge of rewriting Tony’s script to get it done (maybe Krutiov is also a frustrated playwright?) But it is not so impressive if you consider that Tony really didn’t love Maria, he loved his play so it wasn’t much of a stretch to get him to betray her and his country. Now if Krutiov was able to manipulate Walter to betray Maria, the woman he loved, then that would have been an impressive feat indeed. Serdeych (We’re Off to See the Wizard) was also in contention. Melissa (I think it was Melissa) wondered if the Russians were going to take top prize, it’s certainly looking that way but the plot is just too complicated and unfocussed for me to really care. I even watched it again and nope, still don’t care, though I understand if you feel differently. Maybe it was Lee coming quite uncharacteristically undone and blaming Paul for everything bad that ever happened, the fact we didn’t see Serdeych until quite a bit into the episode, or the screaming clues on Serdeyich’s identity that no one picked up on kind of make me feel ‘meh’ about the episode. Lee: Hi Paul, How’s it going? Paul: Not good Lee, I’m still trying to find that no-good nasty Serdeych . Lee: Yes, he sure is heartless. Remember the good old days, in the Oz network and we had Tinman infiltrate the Russians pretending to be on their side? Wow – I wonder who betrayed us to the Russians, it is not like any of us in the Oz network had any way of regularly communicating with them. Paul, why did you give him the code name Tinman, anyway? We all can guess why you tagged me with “Scarecrow”. Paul: No, actually it was the Russians that gave the Tinman his codename. Lee: Whoa – that’s pretty wild. I wonder why they named him that. Did Tinman have a heart condition? Because, you know, in the book, the Tinman didn’t have heart. Paul: Not that I know of. I am still wondering who betrayed us. That was pretty cold and heartless. Lee: Maybe it was the Cowardly Lion. With a code name like I am not surprised he didn’t last long in the business. Yes, I know Tinman was supposedly blown up at the landing strip, but come on! It’s not like you’ve ever heard of people coming back from the dead. For heck’s sake, you’ve even faked your own death. He does get points for using a doppelganger (which, though not necessary, certainly works in his favour for a Laser Shark Award.) It just seems too random for the coveted top prize. 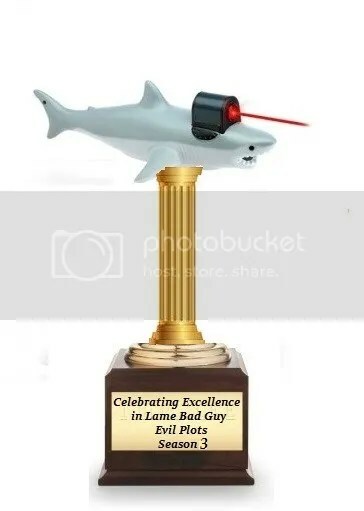 Without further ado I present the Laser Shark Award to….. Drinking tea is for wimps. Laser Shark winners eat caviar and drink the finest brandy. Look at me, stroking my evil beard! Phew! That man gets things done. I am happy if I remember to put my laundry in the dryer. My only regret is I shaved my beard. 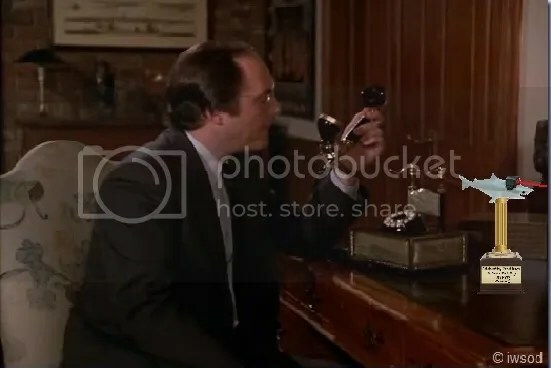 The plot gets WAY more complicated than this, but I am willing to entertain the thought that Gregory was putting this in motion for a long time, even before “Tail of the Dancing Weasel”, he strikes me as a ‘many irons in the fire’ type of guy. Now here is where it veers into Laser Shark territory. I am not sure where or how he found a Towne lookalike but really, what was the point (other than for Laser Shark purposes)? From what I can make of this mess, the US government was supposed to believe that Towne was really a KGB agent (who did not create or have access to secret codes or algorithms that the United States used) This supposed KGB agent and respected professor would happily do his mathing bit in the hopes he would develop a theorem, submit it for publication and wait to see if his formulas get classified for being too close to the real thing so he could run those over to the Soviet embassy. Seems like a needle in a haystack to me. 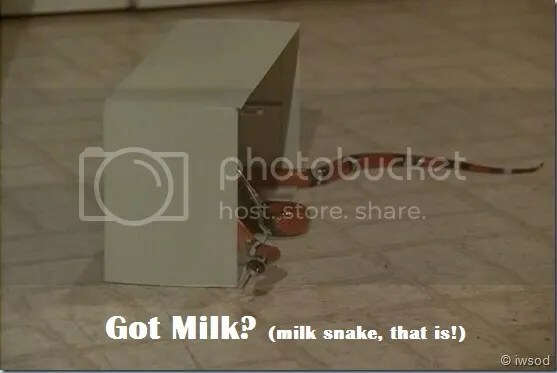 And I don’t really understand the need for the Wally Tuttle persona and putting Towne’s fingerprints and fibers in the condominium and faking his death notice. Just plant evidence that Towne is KGB and grab him. Or knock him out and slip him some déjà vu drug or whatever Frank Duran used. Easy Peasy and no one is the wiser. No, I think Gregory loves the thrill of the game so much, he couldn’t resist a plot (the more convoluted the better) to get the best of Billy. If Gregory were playing chess, not only would he be thinking 5 moves ahead in the current game, he would be plotting his moves 5 games from now. Until we met again, Billy Melrose! A huge thank-you to all of you for tuning in, and of course, my undying gratitude to IWSOD and this wonderful blog. Please share any thoughts you have about whether Gregory was truly deserving of the Laser Shark Award! Until we met again, ta ta for now! (Doing my best Majel Barrett impression) Last time on the Golden Teacup Awards…. The Francine Fashion Faux Pas meme was alive and well in Season Three. The JustWalkWithMe family erupted in chaos arguing whether this was enough evidence to tip Francine into the BadlyDressedBadGuy territory. Several of us suffered PTSD flashbacks as we may or may not have worn similar outfits back in the day. Silver teaspoons (so close yet so far!) were awarded to Donna Clayton, Carla, Nick Cross, Frank Duran and Kenneth Clayton Dobbs. Krutiov threw a temper tantrum when he realized he missed a Golden Teacup by this much and is actively campaigning to get a recount. Golden Teacups were awarded to Daisy “Not-a-hair-out-of-place” Dispatch, Steven Sallee, Peter Sacker and Jeppard aka the King Cobra. When Jeppard realized he missed top baddie, he just smirked. Somehow I don’t think he really cares. Evil Pam’s evil plan (say that 5 times fast) was two years in the making, which is really impressive unless you consider Frank “Puff the Magic Dragon” Duran’s 20 year plan for revenge or Kenneth Clayton-Dobbs happily wreaking havoc on world economies for 3 decades. Then again, neither Duran nor KCD had to spend time with Randall “Groovy” Skylar (or it that Skylar “Groovy” Randall?) I am sure those two years with this guy felt like a very, very long time. And after those very long two years of working closely with Randall/Skylar and listening to “Barbed Wire Love” for the millionth time, I can’t blame her for being a little stabby near the end. I certainly would be tempted. Here is why Pam is Numero Uno. She’s an arms dealer of world renown and was already a ‘much sought after enemy of the (Soviet) State’. This is an impressive accomplishment, because unlike the Golden Teacups, the Russians don’t bestow that title willy nilly on just anyone. She then went quiet after her big score, but somehow managed to meet and convince Skylar to front her “Food for Flight” organization, whose sole purpose of raising funds and collecting food is to smuggle those detonators to Pakistan. No one can argue that Pam is not hyper organized. The skill it takes to run a not-for-profit of this size (and an illegal arms smuggling business) is huge. Though I do wonder how much Rajmand was willing to pay her, it would seem very easy, safer and potentially more profitable to have “Food For Flight” pay her an exorbitant salary like many of the other charities. Maybe she needs the challenge. Would her complicated plot make her worthy of the Laser Shark Award? It certainly has a delicious irony in her plan (using US Air force to smuggle the detonators, and having the Congressmen’s wives and First Lady support a charity that was supplying nuclear weapons to their enemies). She doesn’t mind having to do good (in her mind, a necessary evil) if that means she can get her detonators smuggled– to Pam, the end always justify the means. I thought about it, and (because I am totally making this up as a I go along) and have decided she doesn’t qualify because she is too pragmatic and her plot had a plausible chance of succeeding. Only two things stood in her way Rajmand and Ronald Reagan. Rajmand, though enthusiastic, was not the brightest bulb. As evidence, I present to you his LAME-O assassination attempt at the taco stand – he deliberately runs into another car to force it to run over our superspy trio. What an amateur! In case you are not convinced, here is a shot when he drove the conveniently available airplane fuel truck over the conveniently placed cliff. Oh my heck, I shouldn’t laugh, but really! It was probably Rajmand who insisted on smuggling out the first detonator early that tipped their hand in the first place. But the liability of dealing with Rajmand wouldn’t derail her perfectly laid plans. She calculated that smuggling out the first detonator was low risk even if discovered. In her wildest dreams, she never would have expected Reagan to own up the theft to the Chinese and Russian leaders. Smart money would be on the deny, Deny, DENY! tactic. Even then, it took three enemy governments and their best intelligence agents and three incredibly smart and resourceful women working together to take her down. She originally lost points through how easily she gave up the information to Nadine, but I figured Nadine probably had access to of Krutiov’s Deja Vu drug so Pam couldn’t help spilling about truck 52. If Pam didn’t win the Laser Shark Award, then who did?……. 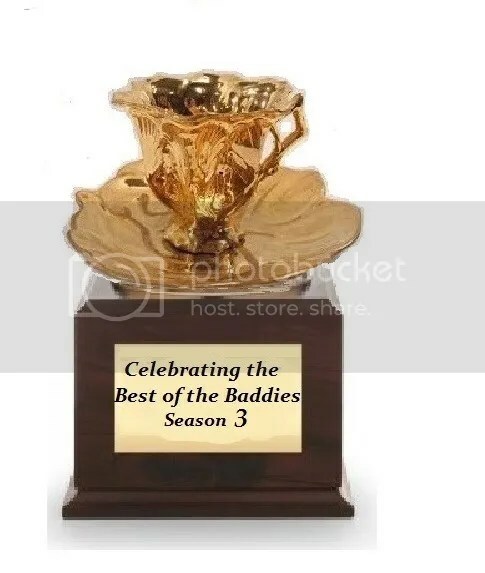 Come back for the final post in the Season 3 Golden Teacup Awards to find out! Please share any thoughts you have about the top Baddie for Season Three!